The EU economy is entering its sixth year of uninterrupted growth and all Member States are expected to grow over the forecast horizon. But the moderation of momentum since the start of the year and leading indicators both suggest that economic growth has peaked in 2017. 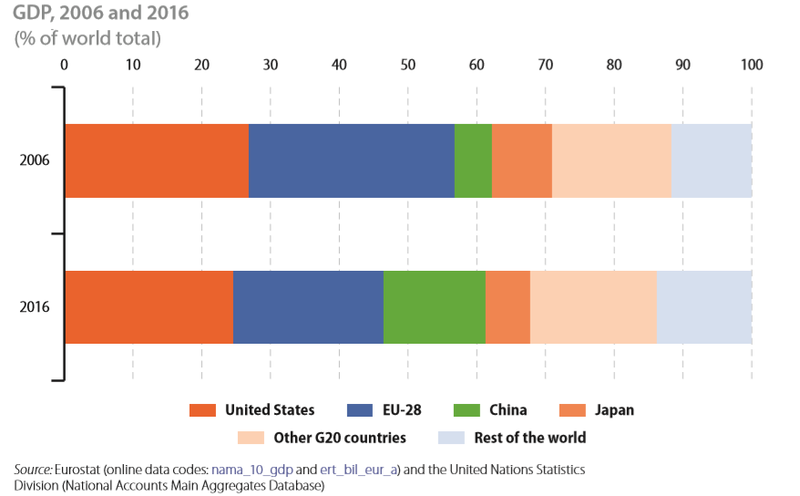 The extraordinary impulse from the rebound in global growth and trade enjoyed by the European economy last year is already wearing off, as the outlook for global growth is weakening and trade tensions have risen. The strength of Europe’s domestic growth drivers should however be sufficient to allow activity to continue growing and unemployment falling. 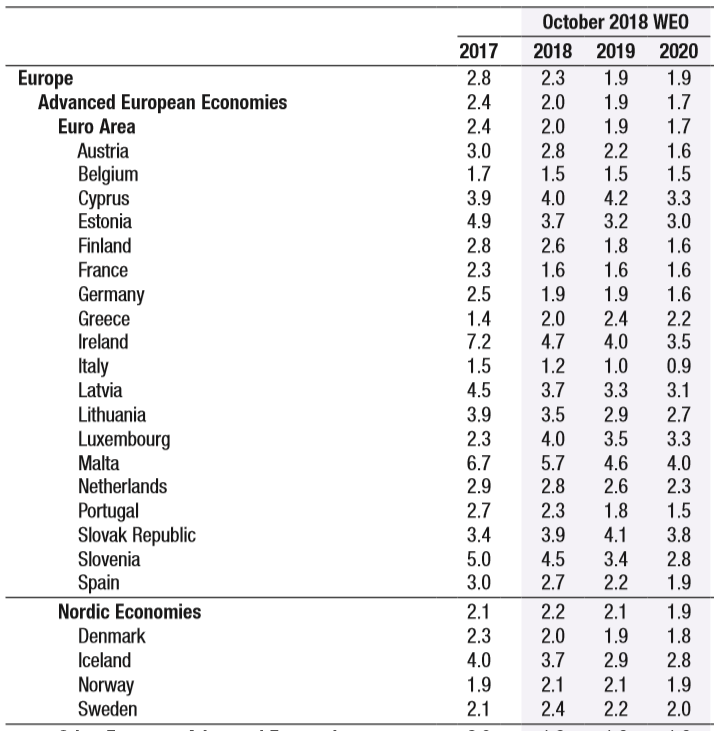 The improving labour market, slightly stronger wage growth and expansionary fiscal measures in some Member States, should help to sustain consumption next year. In addition, investment should enjoy the continued support of still favourable financing conditions, even assuming the gradual normalisation of monetary policy. The outlook, however, is clouded by the presence of a number of interrelated downside risks. 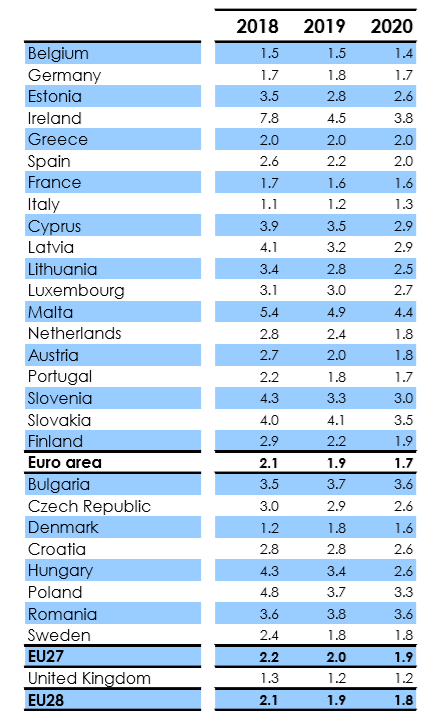 From 2.4% in 2017, euro area GDP growth is forecast to moderate to 2.1% this year and 1.9% in 2019, slightly below the growth rate projected back in the summer. It is then expected to ease smoothly to 1.7% in 2020. Exogenous factors, such as fading world trade growth, rising uncertainty and higher oil prices should have a dampening effect on growth in general, while economic activity should also weaken as labour market improvements slow, slack diminishes, and supply side constraints become more binding in certain Member States.